All transactions are safe and secure with a reliable history in online purchasing behind each of our associates. Buy the Superman Hats and Beanie Caps to own Superman clothing and merchandise. 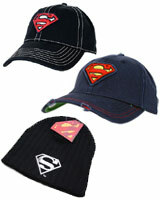 Disguise yourself in a Superman cap featuring the shield logo from the movie. Choose from a variety of options, including the classic blue, yellow and red hats that feature the hero's familiar symbol. Get stylish with a Superman fedora or face the cold wearing a knit Superman beanie cap. In addition to the Superman Hats and Beanie Caps above, browse the Superman Clothing Gallery for more apparel like men's and women's clothes, kids shirts or hoodies.